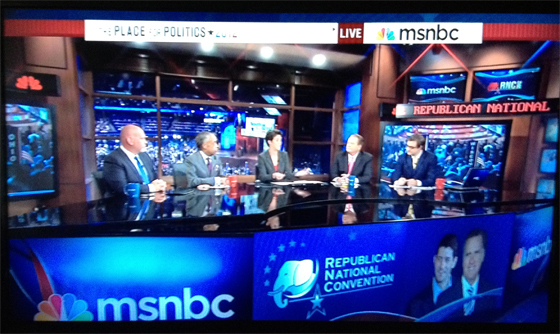 MSNBC is back in Studio 8G, usual home of “Football Night in America,” for its convention coverage. The main desk is as crowded as a football pregame show, only this time, decked out with patriotic tones. For a network that is very good about using similar styled sets for everything, the use of this set is quite a surprise. 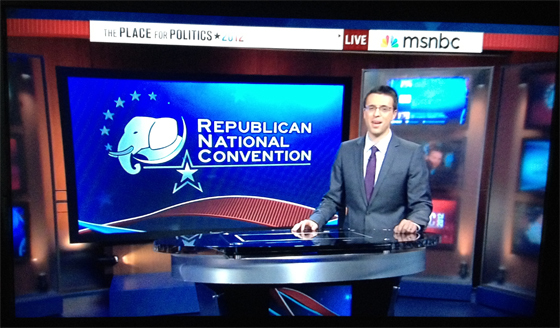 It matches the NBC News on-air look, but not MSNBC. This studio has served as home for NBC News election coverage dating back to 2006. As an interesting side note, this studio was also used in the late 70’s for election coverage. 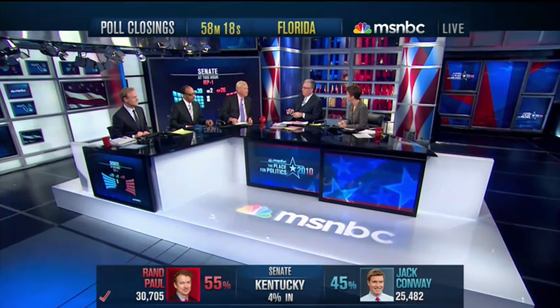 MSNBC uses sets that are sleek and polished, with metal, backlit plexi and monitor walls. While this set has plenty of monitors, it also has plenty of wood. The main MSNBC set in Studio 3A would have been plenty big for the coverage, we can name at least 2 desks that would hold five people, see above photo. It would have just been a bit cramped. The use of this set is also a bit disingenuous. In some single shots the anchors appear to be in Tampa, anchoring from the main NBC News/MSNBC location. In reality, they’re in New York City. Only when analysis begins, and you see the desk, do you see the full picture. This is not a new trick, as NBC News does it every weekend during “Nightly News,” acting like Lester Holt is on the main set, when he’s really in a news nook.